Excellent for Renaissance faire or SCA fencing, combat or wedding, LARP or role playing, Halloween costume, costumes for any medieval, Gothic, renaissance, or SCA wedding, western black powder rendezvous, re-enacting and Shakespeare theater costuming garb, solid and secure parrot and bird of prey and falcon arm perch, and more! Simply lace and tie them and then tuck in the ends to keep them out of the way for ease of wear!! Measures 8" long (up the arm), and goes from a 7" at the wrist to 10" at the fore-arm. *Note - leather color may vary slightly from pictures as we cannot control individual monitor settings. 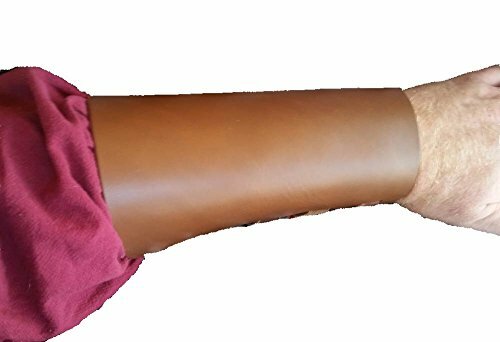 Simple leather bracers for medieval Renaissance Faires and wedding costume, SCA garb, LARP or gothic costumes, pirate faires, role playing, or theater costuming. Solid Oil-tanned Latigo Leather - NOT glued-together imported cardboard garbage. 9-10oz leather (about an 1/8" thick!). Great arm guards for birds of prey, large parrots and cockatiels. If you have any questions about this product by Leather Mystics, contact us by completing and submitting the form below. If you are looking for a specif part number, please include it with your message.